Elite Image Remanufactured Canon Toner Cartridge - Toner cartridge is designed for use with Canon LaserClass 510. 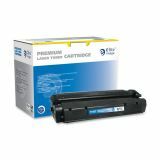 Cartridge yields 3,500 pages on 5 percent coverage. Elite Image is ISO certified.